20 Printed Limited Partnership stock certificates with Unit designation. 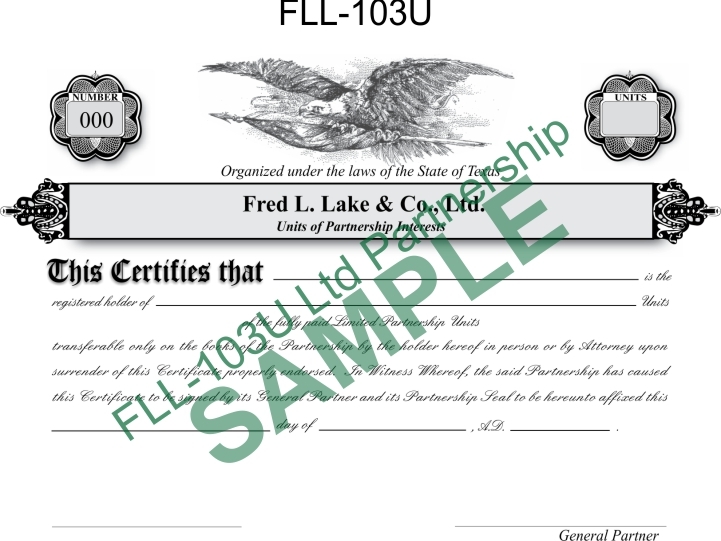 Nicely bound and custom printed book of 20 Fred Lake™ LIMITED PARTNERSHIP UNIT Certificates & Stub Sheets (now available in 5 border colors! ), complete with 3 holes to fit a standard 3-ring binder. Micro-perfed top edge makes removal of individual certificates neat and simple. Our certificates are all custom printed on FoxRiver™ select 24lb. paper with 25% cotton and recycled fibers. May be ordered loose (unbound) and without holes by special request in the Special Instructions box below. Please note that bound certificates may serve as a deterant to fraud.